I only have half a wing and the central fuselage to show for.... decaling is such a chore....blehhhh. Aside from the other half of the wing, I still have the underside to decal up. When I was a young boy, I don't think I've ever fully decaled up a military aircraft kit before. I always stopped when it got to those "No Step" decals for the wing parts. As a young boy I didn't have the patience to decal up all those parts. 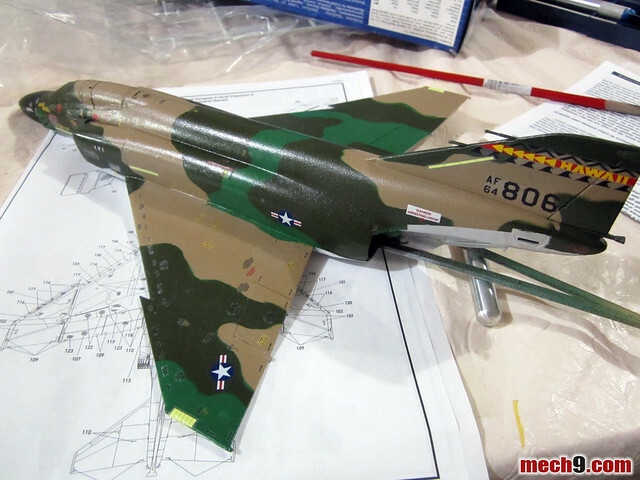 With the Revell 1/48 Phantom II C/D I told myself that I'd do right by finally completing the decaling of an aircraft kit. That was before I realized that there are over 400 decals in that sheet. But still, I've got to live up to what I set myself out to do. Judging from this pace I'll probably complete the decaling process in 3 more days. Then I still have the landing gears and weapon systems to work on.